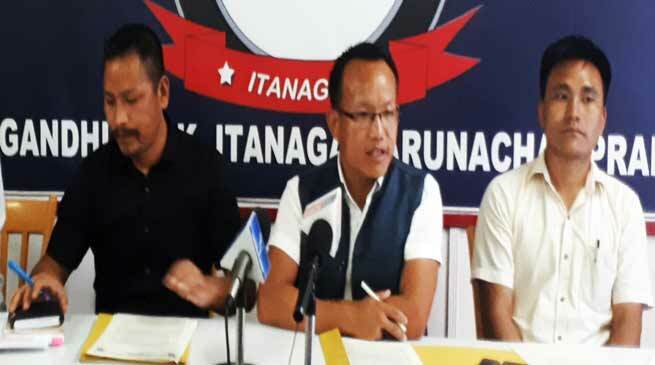 The central executive committee of All Arunachal Pradesh Sarva Shiksa Abhiyan Teachers association (CEC-AAPSSATA) in a press conference held today has sought exemption of in-service SSA teachers from APTET. While addressing to media CEC-AAPSSATA President Tarak Agung Tarh said that TET was not mandatory criteria for SSA before 2013 and Right to Education (RTE) came after the same year. The association also referred to a memo of 2013 which stated that the vacant post of PRT/TGT to be filled up on seniority basis. It has also requested the government to take up regularization on batch wise. The committee has urged the education minister to create a mechanism to deal with the issue and form a political committee along with opposition party members. He said that recently a circulation was served for applying for renewal of service for SSA teaches which have never happened and sought complete ban on service renewal system. While appreciating the state government for including education sector in the budget session. It has also thanked the state govt for enhancing the salary and every year based on DA salary of SSA teaches will automatically increased. The president also stated that the state government has complied with the long standing demand of enhancing the salary and conveyed gratefulness of all teaching community to the government. Meanwhile the committee has appealed to all teachers to perform their duties regularly.